← The Perfect Granola Bar Bites…Finally! Roasting a chicken is a great idea. It is comforting. It is delicious. It is fulfilling (and filling). And the carcass makes a mean chicken stock. 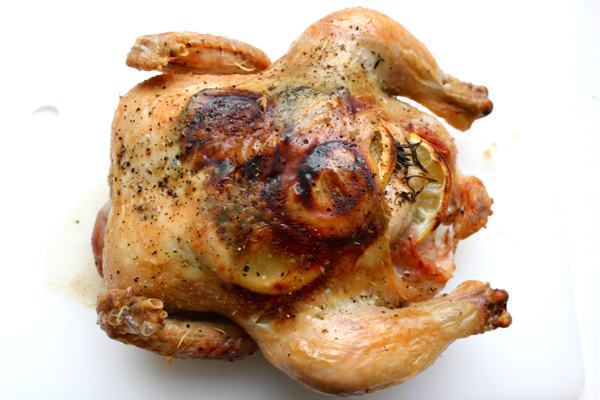 Here is my method for making the most delicious, juicy, perfectly cooked chicken. The white and dark meat come out equally as good! Get started by preheating your oven to 450ºF with your heavy pot or baking dish inside the oven. Halve a lemon. Leave one half alone, and cut the other half into thin slices. Pull out some fresh sprigs of rosemary and thyme, and scoop out about 1 tablespoon of coconut oil or regular vegetable oil. Most importantly, get your chicken! I like smaller, kosher chickens. Mine was about 3.6 pounds. 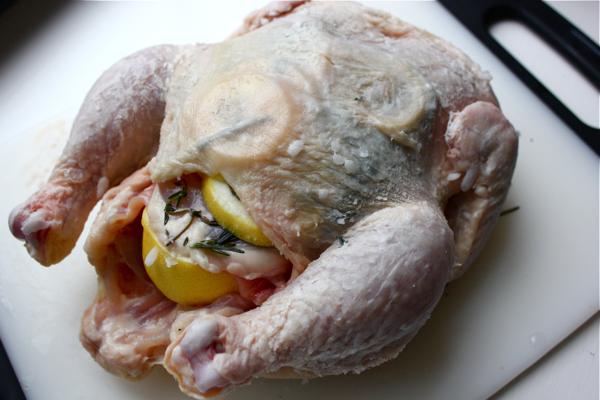 Use a paring knife and your fingers to separate the chicken’s skin from its breasts. This step used to make me queasy, but I’m heartless now. First, stuff the herbs into the pocket you created. Then, layer in the lemon slices. 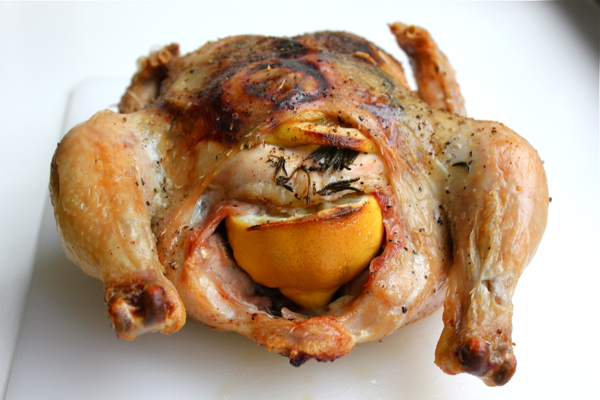 Stick the other lemon half inside of the chicken’s cavity (after removing the giblets). My chicken didn’t come with any giblets, and I don’t know why. Mammy would have been disappointed. Then, pat the chicken down with a paper towel, and slather it with the coconut or vegetable oil, even on the bottom. Season the skin with salt and pepper. Take your hot pot out of the oven, and carefully place the chicken inside with the breasts facing up. You should hear a fantastic sizzle and immediately start to smell the chicken cooking. Putting the chicken down on a hot surface before it ever gets into the oven allows the dark meat to snag a little extra cooking time. Loosely cover the chicken with tinfoil, and let it roast in the oven for 20 minutes. Then, remove the foil and turn the temperature down to 350ºF. Cook a 3 pound chicken for 45 minutes. Add 15 more minutes for every extra pound on your bird. Your chicken is done when the legs move easily and only clear liquid comes out of the chicken’s cavity when you tilt it. 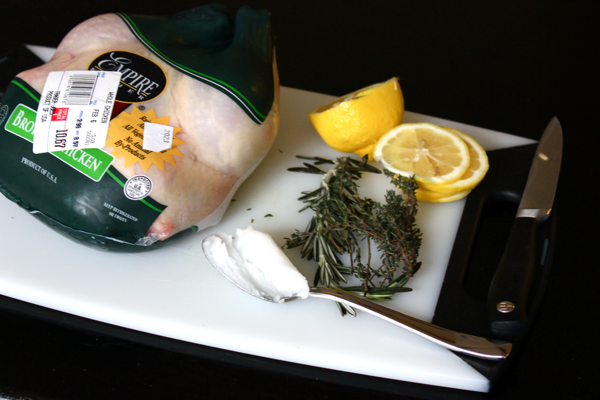 Carefully remove your chicken to a side plate to rest for about 10-15 minutes before carving it. I move my chickens by sticking one side of tongs into the cavity as far as it will go and lifting. 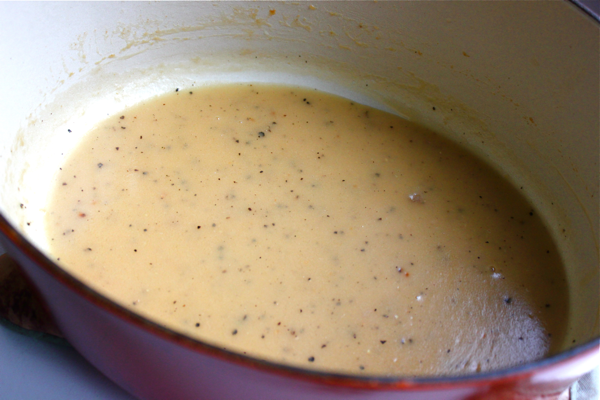 Now, you can make chicken gravy. I was watching Rachael Ray and saw her make turkey gravy, so I decided to give it a try. It’s awesome. Pour most of the grease out of your pot while keeping the browned bits inside. Put the pot over a medium flame and melt in 1/2 tablespoon of butter. Then, sprinkle in 1 tablespoon of flour, and whisk it around so that it absorbs all of the butter, fat, and browned bits. Once the flour starts to brown, pour in 1 cup of chicken stock. Whisk it until the gravy starts to thicken. Season it with black pepper. Carve your chicken once it cools down a little bit. There are some great, instructional YouTube videos on this topic if you need some extra confidence. If the skin needs to be crisped up (mine did because it rested for a few hours instead of a few minutes), put the pieces on a baking sheet and let them sizzle under the broiler for a few minutes. 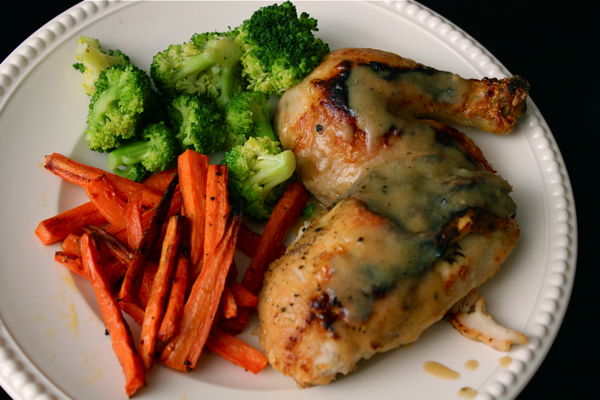 Plate your chicken and spoon over some of that delicious gravy. Yummmm. So savory. I literally picked the carcass clean. 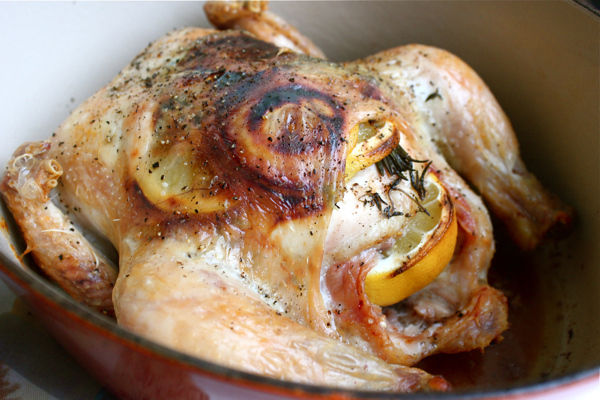 I’ve always been afraid to roast/cook a whole chicken, but this recipe looks great and gives me courage! I think I’ll try it soon. Thanks. This was my first “special dinner” dish only I’ve always tucked in a few cloves of garlic for a little extra flavor. 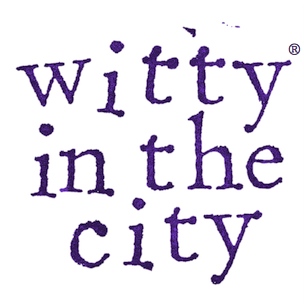 It’s fantastic hot and unbelievable cut up and served cold in salads and sandwiches.